The music world woke up this morning to the news that Jim Marshall, the founder of Marshall Amplification, whose inventions and innovations not only changed the sound of rock music but the look of it as well. Joe Satriani: I'm deeply saddened on the news of Jim Marshall's passing. He created the tone we all cherish in rock: Big, bold, beautiful and in your face. With every power chord, soaring melody and searing lead we will continue to salute his legacy. R.I.P. Lord of Loud, Jim Marshall." Slash: "The news of Jim Marshall passing is deeply saddening. R & R will never be the same w/out him. But, his amps will live on FOREVER! \,,/,"
Zakk Wylde: "GOD BLESS FATHER MARSHALL... I Thank The GOOD LORD I was Blessed To have You In My Life... You Rule." Wylde then re-Tweeted: "GOD BLESS FATHER MARSHALL... The Saying goes, 'Leave This World a Better Place, Then Before You Got Here'...He Did"
Joe Bonamassa: "A very sad day for the Marshall family. My thoughts and prayers go out to Paul and his family. 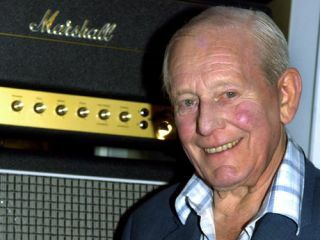 Rest in Peace Jim Marshall OBE..."
Joe Perry: "Great sorrow hearing bout the great Jim Marshall passing. Everytime we plug in and make people smile,we owe him debt beyond counting!!!" Tom Morello: "Amp stolen in '88.The store hadda Marshall vs latest solidstate fancy one.Flipped a coin.Changed my sound & my life.RIP Jim Marshall &thanks"
George added: "I think it's finally time for you to get some rest my friend. Head to the bar, my Dad will be waiting to buy you a drink. God bless xxxxx"
George followed up his messages with this picture of himself and Jim Marshall taken last year. Dave Mustaine: "I have never been sadder than today. My dear friend and father figure Dr. Jim Marshall OBE has passed away. I am at a loss for words..."
Doug Aldrich: "Jim will shine on forever... He was maybe the single biggest influence in music. RIP Dr Jim." Steve Lukather: "RIP Jim Marshall.. changed guitar amplification and rock n roll forever! God Bless him..."
Glenn Hughes: "RIP Jim Marshall...a brilliant man..and dear friend...ROCK musos worldwide will miss him dearly...GH"
Yngwie Malmsteen: "Jim Marshall was a dear friend. The news of Jim passing is deeply saddening, everyday I plug in the studio or stage he will always be there."